The Desert Island Disc – every music fan, especially those who are critics, has one. Usually revered for both sonic beauty and a sense of neglected genius (See: Lester Bangs on the Shaggs’ “History of the World”). 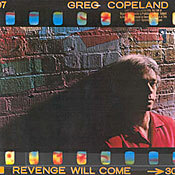 For me, that record is Greg Copeland’s “Revenge Will Come,” which arrived in 1982 like a Molotov cocktail lobbed at the coked-out complacency of Southern California soft rock and nascent Reaganism. Jackson Browne, Copeland’s friend and sometime collaborator since high school, produced it. But even though they shared a history (and A-List studio musicians like Danny Kortchmar and Bob Glaub), this was no “Pretender” – not by a country mile. Which so offended Cleveland’s biggest rock music station, they refused to play the album. It’s a crime that Black Flag never covered the song. But the real power of “Revenge Will Come” came during its uncommonly tender moments. Prisoners, trailer park denizens and the criminal-minded all shared a piece of Greg Copeland’s warm heart. Though it entered my bloodstream like adrenaline, the rest of the world mostly ignored “Revenge Will Come.” The record never appeared on CD, and Copeland didn’t perform it live – ever. On the album’s cover, the songwriter stands half in the shadows, emanating wariness of the spotlight. Among the few interviews he did, one might have made him a star. Paul Nelson, who’d written about Dylan when he first hit Greenwich Village, signed the New York Dolls, and ran the record review desk at Rolling Stone when such a thing actually mattered, talked to Copeland in late 1982. But he resigned from the magazine before writing a story. Nelson’s biographer found a cassette of their conversation shortly after the critic died in 2006. He’d made a record with one of music’s biggest stars, released it on the powerful Geffen label (which included Elton John and Donna Summer), and then vanished. I asked about Copeland during a conversation with Jackson Browne in 1986, and even he didn’t seem to know where to find him. Over the years, I’d check record store bins for signs of his work; when the Internet emerged, I Googled “Greg Copeland” more times than I can remember. I wore out two copies of “Revenge Will Come,” and every time a new technology came along – MiniDisc, CD-R, MP3 – his was the first music I’d convert. Then a few months ago, word arrived of a new Greg Copeland record, the first in over 26 years. The album, entitled “Diana and James,” was released on Jackson Browne’s own Inside Records label in mid-October. It’s easy to mistake “Diana and James,” for the work of a different artist. The smooth fury of 1982 is scuffed and weary in 2008. Copeland’s voice, once a close cousin to Walter Egan or perhaps Lindsey Buckingham, is now a ragged-but-right combination of John Hiatt and Bob Dylan. But sentiments at the heart of both records – love is neither given nor guaranteed, sorrow can be overcome but never banished, and doubt can cling like morning fog to every single day – stitch the years together. Copeland and producer/guitar wizard Greg Leisz lured some amazing players into the studio for this project, which took over five years to complete. Standout performances include violinist Carla Kihlstedt (Tin Hat Trio), who shares an eerie lead vocal on “Palace of Love,” Heather Waters’ tasteful harmonies on “A Woman and a Man” and the title track, and Gabe Witcher’s (Punch Brothers, Loggins & Messina) mournful fiddle playing. Keyboard player Phil Parlapiano evinces an incredible soft touch, just enough on “Who You Gonna Love” and “The Only Wicked Thing,” the latter a playful speculation on the night Hank Williams died. Leisz, who plays on every song, is wonderfully ubiquitous on lap steel, acoustic, electric and baritone guitar. His restraint and elemental musical sense behind the boards elevate “Diana and James” into brilliance. Dreams of burning the world down once fueled his fury, but those emotions belong to another life, another time – another man. Older, wearier and somehow serene, he now follows the promise of a dim, durable flame. Greg is an extremely talented musician and insightful writer who deserves more knowledgeable and thoughtful reviews like this one. Viva Diana and James! You can click on my name above and visit the page i’ve set up for Copeland. We still wait for the cd of ‘Revenge Will Come’- a timeless classic. Come on Inside! Thanks for posting this info about Greg Copeland and his latest CD. I, too, have Revenge Will Come right up there as one of my all-time favourites. I thought it was fantastic when it first came out in 1982 – I bought it sight unseen after reading the review in Time magazine, and it stunned me from the first listen. All these years later, I didn’t think much about his music until I recently bought a phono pre-amp for my record player and started playing all my old records again. BTW, I too managed to speak to Jackson Browne backstage at one of his shows in 1989 (I think) in Minneapolis and asked him about Greg Copeland. Jackson mentioned that Greg became a lawyer, active in environmental issues, but other than that, lost touch with him. Now, I’m off immediately to buy Greg Copeland’s latest CD! Thanks again for this site. DITTO to everyone above. I discovered G Copeland in college while working college radio. I was and am a huge Jackson Browne, Zevon and Lyndley fan and was blown away by “Revnge Will Come.” I have the original LP but am too afraid to play it until I found all of the songs on youtube. I too have been looking for a digital version for my IPOD, please ITUNES get your poop grouped and offer this national treasure to those who still believe in the message that Copeland sang of in 1982. My favorite song, Eagleston! This album reminds me of the days when music seemed important and it really could change the way you feel and think. Readig the review and the subsequent comments gives me a feeling of belonging. I really thought I was the only one who knew or cared about this man and in particular this album. Thank you to all of you. One of the best albums of its time and still sounds great today. I’ve turned many friends on to the album Revenge Will Come and they too became fans of his songs. We still have it on our playlist when we get together and some of the cuts are our party favs. I converted the album to a CD years ago and have had it on my iPod for as long as I can remember. I purchased Diana and James when it came out. It really grew on me and I have concluded that it’s a great piece of work too. His albums are very under appreciated. For years I searched the internet and found very little on Greg Copeland. I’m happy to see that he is starting put some of his work on his website.It’s truly great to see him getting back into music! Oh yeah, my wife was recently in California and caught the show with Jackson, Greg Copeland, Steve Noonan and Greg Leisz. She really wanted to see Jackson and Greg Copeland perform together. She told me that it was a very special show! Wonderful to hear that Greg C is playing out. He sent me some tracks from a work in progress in 2011 or 2012, and he still has the touch. But stepping on a stage? That’s wonderful news. Hopefully he will release something soon! My wife told me that he sounded great, but was somewhat shy on stage. It would be great if he hit the road to do some shows.